As Iraqi forces battle to re-take Mosul from ISIL, almost a thousand people are being treated for breathing problems after a sulphur plant was set ablaze near the city. 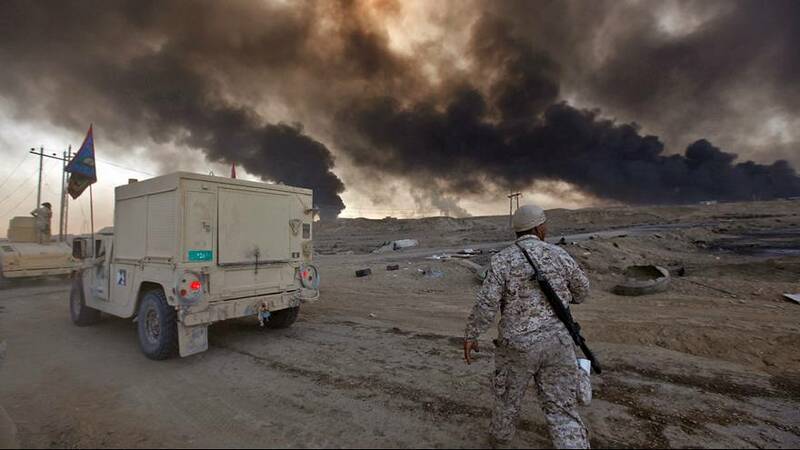 The so-called Islamic State set it ablaze on Thursday during fighting around al-Mishraq, according to US officials. The fire was out on Saturday, Iraqi state TV has reported. “The cases presented were suffocation, caused by the large fire in the sulphur factory near Qayyara,” said Saddam Jumaa, a medical worker. A cloud of white smoke filled the sky where the factory is located, mingling with black fumes from burning oil wells – also said to have been torched by ISIL. Elsewhere, Kurdish Peshmerga fighters have been clashing with ISIL in the village of Batnaya, near Mosul. The battle came as Iraqi army vehicles moved closer to the militants’ stronghold. Meanwhile, ISIL leader Abu Bakr al-Baghdadi was spotted in Mosul a few days ago – a Kurdish minister revealed on Saturday. He is the man who declared a caliphate and himself the leader of the world’s Muslims in 2014.